Welcome to the final part of my series on game programming with 2d art assets! If you don't know already, a texture atlas (also known as a spritesheet) helps game developers to display neat 2d graphics in to their games. There is usually some sort of organization sanity happening with them as well, for example, all of the frames of animation for a player character would be in one atlas and its file name could be "herowalking.png" or something like that. Of course, this isn't limited in any way, I've often used atlases that are just a collection of User Interface components usually in a file called "gui.png" -- it has all the buttons, graphs, meters, check marks, and all sorts of doodads, all conveniently packed in to one GUI atlas file. 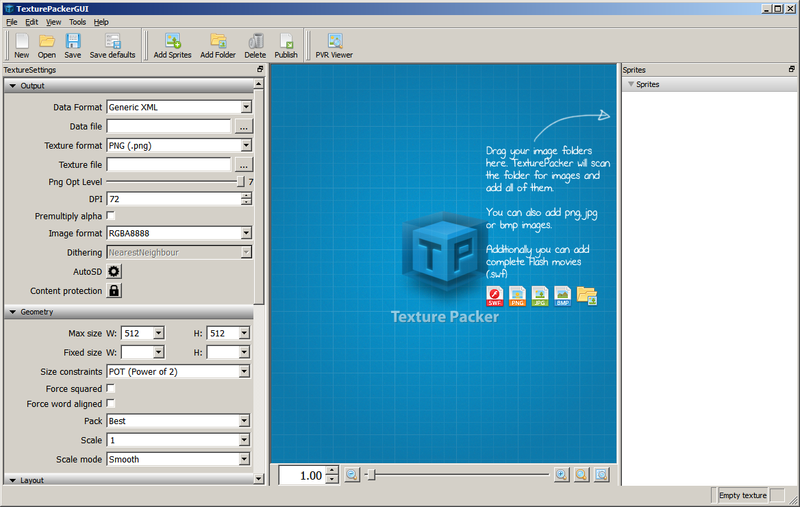 At any rate, assembling a texture atlas can be extremely tedious. You have to make sure nothing overlaps anything else, that all your texture objects can fit, you will even need to remember where you put each object so that a game engine can subsequently extract each object. It is so much planning and tracking! 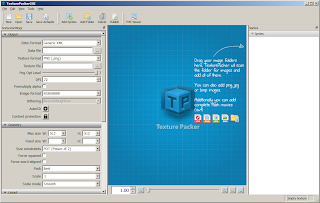 Thankfully, there is a program out there called Texture Packer. It is a commercial product, but all in all, it's a nice, convenient tool to have in your tool belt. I'll even go so far to say that if you make 2d games commercially, you probably shouldn't be without it! It's reasonably priced as well for how much time and money it would save you. Let's put it this way, I spent about 2 weeks making a command line program to extract texture sizes and coordinates and it was a pain to deal with. On top of that, I was still relying on manually entering texture coordinates in to our games from that program's output. If an artist changed any graphics, it would be a nightmare changing things all over the place. This program keeps track of all that stuff, and allows you to output all that relevant information in to various game engine formats; or for us, even a generic XML data format! Honestly, it's pretty good. There are a couple of features that would be nice to have; like manually being able to move texture objects around (or swap places with each other), but what the tool does is automatically find a place for your sprites in the empty atlas for you, so you don't have to sit around with a magnifying glass lining pixels up manually! There are quite a few neat features as well about it, like automatically generating different scaled versions of your atlas (click AutoSD) for catering to different resolutions, being able to specify atlas geometry (like powers of two, max width/height, etc), and it can even import SVG files. It takes a little while getting use to, but all in all, it's a pretty useful tool and saves us quite a bit of time dealing with artwork. I have noticed that the windows and linux ports are a little behind the mac port, and again, it is missing a couple neat features, but all in all, it is useable and useful. They offer a trial version of the program also, so you can check it out without having to buy it first.